Flesh Love RETURNS – photographs by Tokyo-based artist photographer HAL which is expanding on his first repeat of the project and continues his collection of vacuum sealed couples in different types. Pairs of people tightly wrapped in a thin layer of plastic and photographed in an extreme, yet minute moment. The returns series is shot in private, close spaces – such as the couples’ homes, workplaces, and favorite meeting places. We are pleased to present over 40 pieces of prints from Photographer HAL’s Flesh Love ALL projects in different sizes of print with affordable prices for all of people to collect. Meanwhile his all photo books with artist signature are also available to purchase at the 1839 Contemporary Gallery. Welcome to join us on April 7 in the afternoon to meet with Photographer HAL to get more understanding of his Photographic Style. “Legacy of Time Passed”which is his lifetime’s work to shoot the relation with city and nature of Europe at France, Italy, Spain and others since 1970’s.Also in Asia, he documented the changing of life and city of the people with feeling of intimacy. Hara has been photographing numerous scenes of European streets lined with old town buildings and their surrounding landscapes since the 1970’s. His own aesthetic sensitivities and historical viewpoint coupled with his skill of large format photography have brought about the higher degree of perfection to his work. Naohisa Hara was born in Chiba Prefecture, Japan, 1946.Graduated from the Department of Photography, Nihon University College of Art, 1969.Finished program at Nihon University Art Institute, 1971.On Government Overseas Training Program for Artists One Year Internship, studied in France and Germany, 1976. He has been showing “Legacy of Time Passed” of Europe based upon various historical background by his great photographing technique of 8×10 inches camera as well as breathtaking prints. He was a Professor, Head of Department of Photography, Nihon University until 2016. Yumiko’s art as photographs captures life’s flowers in their Secret Garden. To pay homage to the ying/yang of life, the hights/lows, the chaste/tainted. I explored both aspects, photographing in hues of white-on-white (Secret Garden Blanc) and greys-to-black (Secret Garden Noir). Yumiko said that the floers’ life is a metaphor that reflects on the fleetingness of human life. Our existence is one of impermanence and as beings in a universe we are so fragile. Like a delicate blossom, we live to our fullest, knowing all along that gradually we too fade away. Edward Chiu, Curator of 1839 Contemporary Gallery, in conversation with Artist Kenro IZU. Photographer Kenro Izu became fascinated by pears when he encountered them for the first time in New York. He shot them on a large format 8×10 inch camera and exhibited photographs finished using the classic technique of platinum printing. The subject of pears dates back to fall of 1990, but this is the first time he has shot them again in over 20 years. 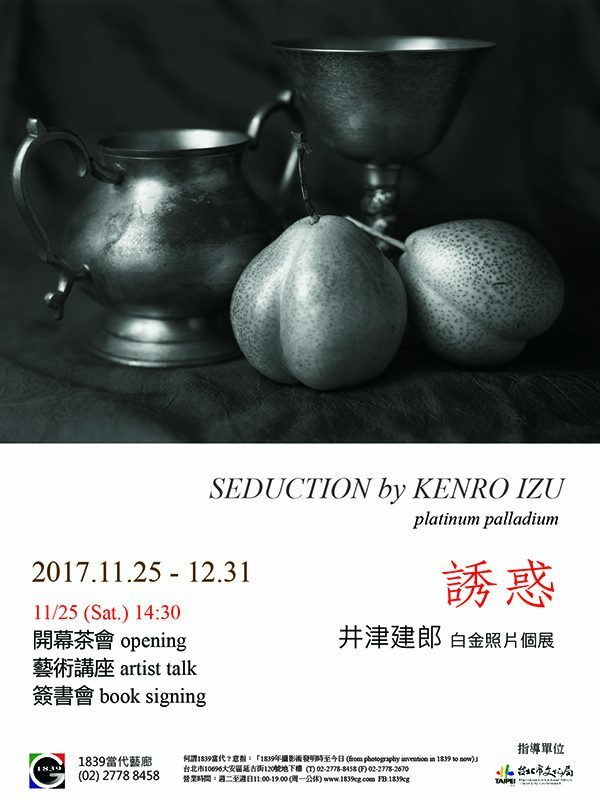 We are pleased to present over 30 pieces of prints made in Cyanotype (blue) and platinum palladium by KENRO IZU. All prints involve hand-painting emulsion onto the paper in darkness prior to exposure. Meanwhile we also offer the limited of signed photo books with special price for the new title “SEDUCTION” which include Flora, Body, BLUE and Orchard series and those studio photographs from 90’s to 2017. 1839 Contemporary Gallery is delighted to host the debut solo exhibition of photographs by talented, female artist, Yumiko Izu. Resonance presents the works by photographer Yumiko Izu’s renowned series Secret Garden and Faraway. The images in “Secret Garden” are an exploration of the ephemeral beauty of flowers, depicting them in various stages of their life cycle. The images in “Faraway” are to search the interaction between life and death, of which has been long perished. The juxtapositions of the two series of works drew us into the rhythms of life, interplay of lives and lives once lived. 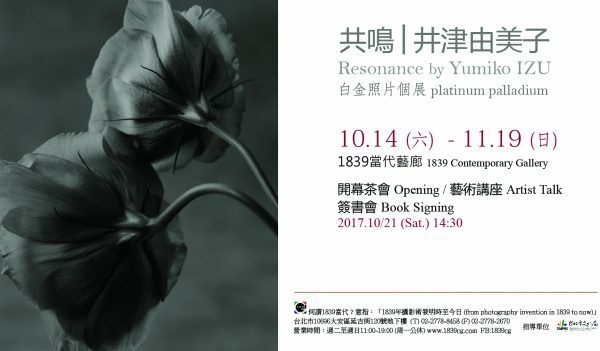 October 21 (Saturday) afternoon, meet artist Yumiko IZU at the Opening Reception, Artist Talk and Book Signing at 1839 Contemporary Gallery in Taipei, Taiwan. 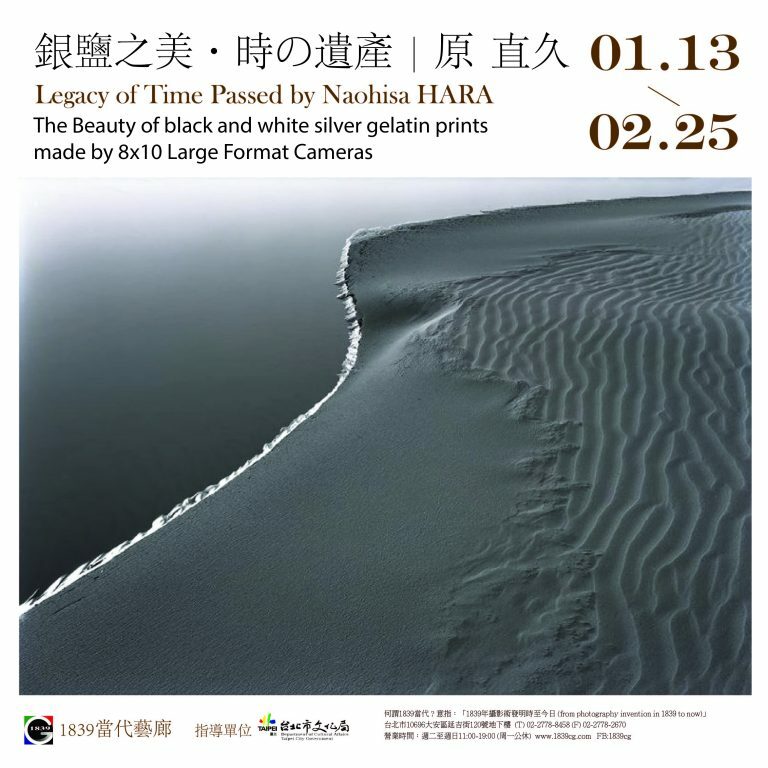 The exhibition showcases Yumiko’s over 30 images of 11”x14” platinum palladium prints. Free Art Talk by Yumiko IZU at 3pm on Saturday 21st of October. The talk’s audience will be limited to 60 people, and advance seat reservations are recommended. Pictures can copy things and events that exist in front of you. Due to the function of the camera, the photograph has been shot for the visible things as information. On the other hand, we seem is what we see in live and need through our eyes. However, such as an emotion, love, time, psychological distance, energy, power of the land, past or memories can be photographed only truly visible ones? 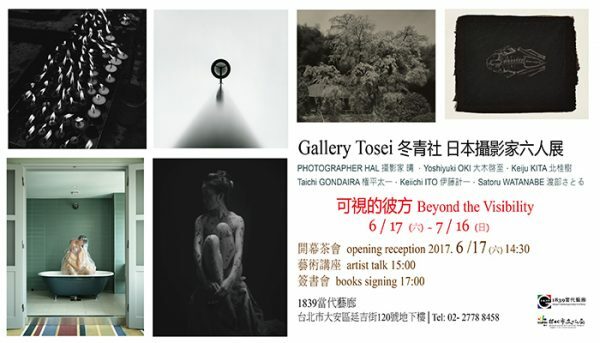 Now, we are exhibition the works of six photographers from Japan, Gallery Tose to show the photographs are not only “what they can see” but it’s beyond what is shown. Welcome to join us the opening reception in the afternoon 14:30, as well as the art talks with artists at 15:00 and the books singing at 17:00 on Saturday June 17th. For many that live in the contemporary world, companion animals have more meaning and value than before. This is because animals have become a way of keeping and sustaining their everyday lives while being earnest companions of their solitary lives. Through these photographs, HyewonKeum hopes that the images do not embody yet another gaze that makes someone become the other. What she is trying to do is to observe and record the culture of commemoration in at a distance, presenting the reality of life in our time. 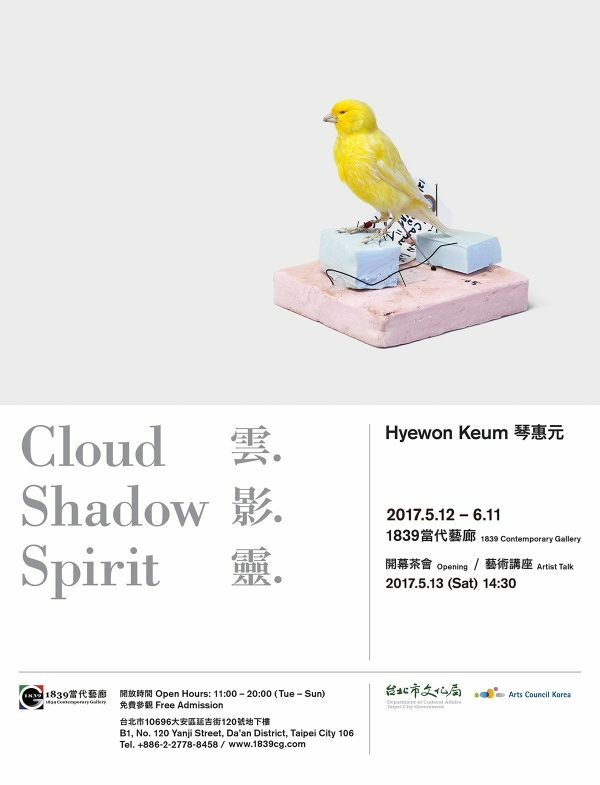 Welcome to join us the reception and art talk with Heywon Keum on Saturday afternoon, May 13, 2017 at 1839 Contemporary Gallery. There have been many decades of culture about the betel nut in Taiwan. Although this subject has ever been discussion and criticized in a variety of ways, but Daigo Yamamoto a Japanese photographer, using an “individual” concept to tell the Betel nuts Beauty. This project had taken him over eight years for study “what kind of person is betel nuts beauty in the end?” The answer is in among of his works. 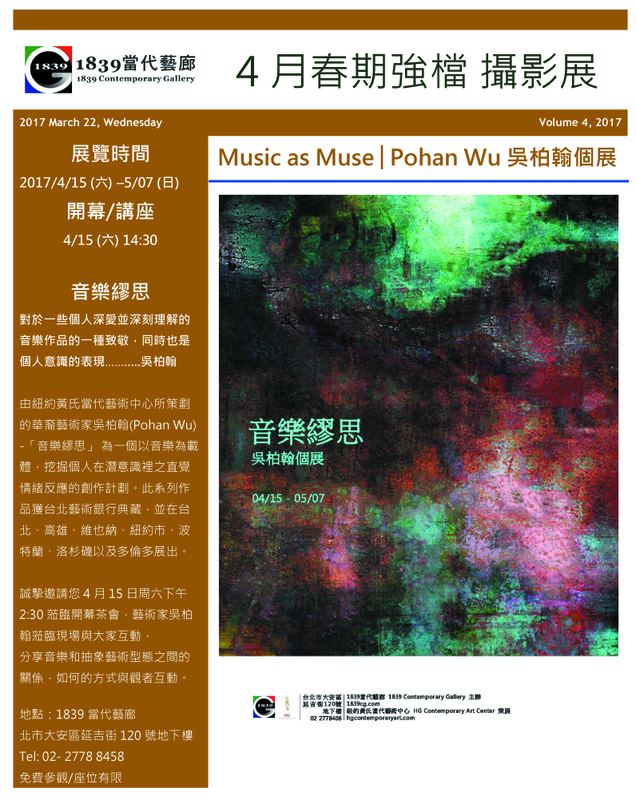 Born in Kaohsiung Taiwan in 1976, Pohan holds a graduate degree in Business Management from State University of New York, currently resides in Toronto, Canada. He intends to seek and record all the human emotions and to explore streams between conscious, subconscious and unconscious to rock one’s mind. Music and visual arts are parallel and share descriptive devices including colour, texture, mood, rhythm and dynamics. “Music as Muse”is a lyrical abstract series using these characteristics to apply in photography, aiming for accessing the deepest intuitions and feelings. Welcome to join us at the opening party starting 14:30 as well as the artist talk with Pohan Wu in the afternoon 15:00 on April 15, 2017. Dr. Edward Chiu, Assistant Professor of Graduate Institute of Cultrual & Creative Design at Tung Fang Design University, in conversation with artist Toshio Shibata. Toshio Shibata is known for exploring the delicate balance between human-made structures and nature. He feels like he is borrowing a place to make his photographs. Photographing erosion control barriers, water catchments, roads, dams and bridges, he examines the unique appearance of such structures in his native land. Through his lens, riverbeds can look like origami, and waterfalls resemble kimono, as well concrete symbolizes something contemporary. March 4th (Saturday) afternoon, meet artist Toshio SHIBATA at the Opening Reception, Artist Talk and Book Signing at 1839 Contemporary Gallery in Taipei, Taiwan. The exhibition showcases Shibata’s over 30 images from Constructed Landscape in Japan. 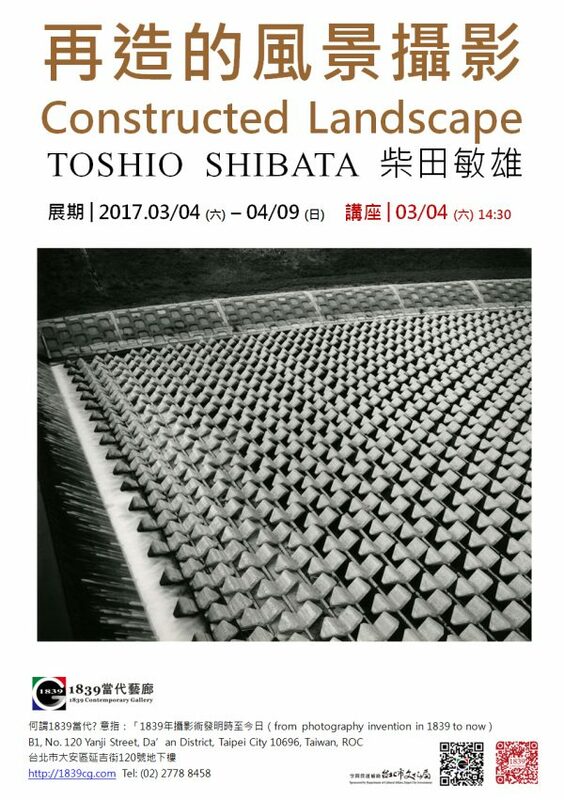 Free Art Talk by Toshio SHIBATA at 3pm on Saturday 4th of March. The talk’s audience will be limited to 60 people, and advance seat reservations are recommended.